1844 by J W Wild. Porch added in 1903. Kitchen and toilet extension of early 1990s. MATERIALS: Coursed limestone rubble with tooled ashlar dressings. Slate roof, except for stone spire. PLAN: Apsidal nave, N and S aisles, SW tower with spire and W porch. EXTERIOR: Neo-Romanesque style. Nave and aisles have wide stone cornice of corbels. Round-headed windows, with square abaci and leaded lights, divided by buttresses. Deep plinth. SW tower of 3 stages with pyramidal stone spire. The top or bell stage has paired round-headed openings with colonnettes and wooden louvres. The middle and lower stages have clasped buttresses. The middle stage has a round-headed window and the lower stage has a large round-headed arched doorcase with square abaci, Caernarvon arch and plank door with fleur de lys hinges. The west end is gabled with a cross-shaped saddlestone, quatrefoil near the apex and three round-headed windows below linked by a dripmould. Below is the 1903 west porch constructed of ashlar with tiled roof, incised bargeboards and Tudor style plank doorcase with elaborate hinges. Behind is a roll-moulded round-headed arch with colonnettes with cushion capitals. Attached to the SW end is the 1990s addition, Classical style on stone rubble plinth with ashlar above. The west side has a pediment and round-headed window with keystone. INTERIOR: Four bay nave with arcade of round-headed roll-moulded arches with corbel heads supported on slender circular piers with square abaci. The apse has a plastered semi-dome with painted firmament and blind arcading below. The wooden roof has tie beams supported on wooden corbels, collar beams, purlins and ridgepiece to the rafters. PRINCIPAL FIXTURES: The apse has three c1844-50 stained glass windows depicting Faith, Hope and Charity derived from those by Sir Joshua Reynolds at New College, Oxford. West window of 1897 by CE Kempe depicting St Peter, St George and St John over Resurrection scenes. The south aisle has a 1896 stained glass window and a marble wall war memorial. The north aisle has a monument to the Rev. W H Nutter d.1909, an elaborate wall monument in veined marble with heavy scrolled broken pediment and fluted Ionic pilasters. Octagonal wooden pulpit. Early C20 stone font with circular bowl on chamfered base and wooden cover with carved cross. 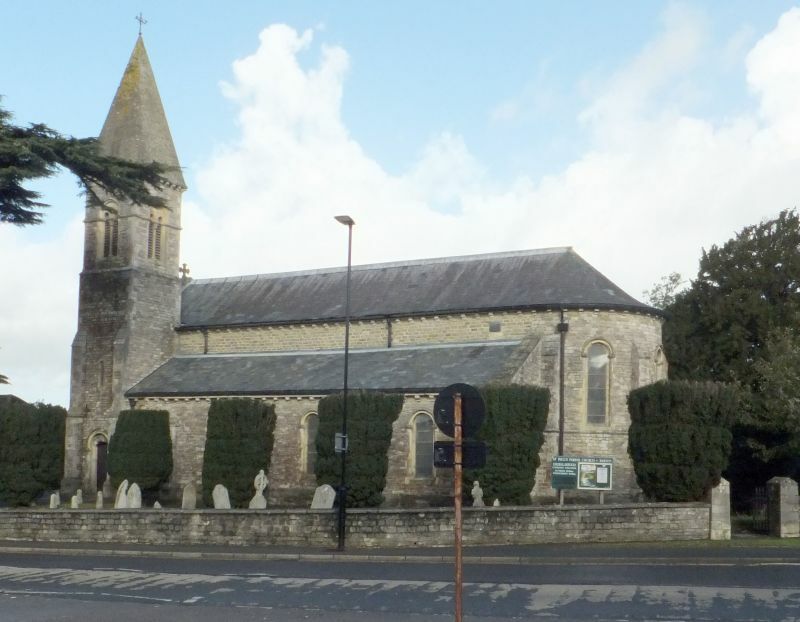 SUBSIDIARY FEATURES: A contemporary low churchyard wall of coursed limestone rubble with ashlar coping, incorporating two stone gate piers with cast iron gates and cast iron overthrow with lamp. HISTORY: The Church is by James Wlliam Wild (1814-1892) who was articled to George Basevi in 1830 and elected an associate of the RIBA in 1837. His church masterpiece was Christ Church, Streatham (1841), a fusion of Early Christian, Italian Romanesque, Islamic and Moorish elements of great originality. Like his earlier work, St Paul's has lower aisles and an apsidal end but the tower with spire is lower and integrated with the nave rather than a campanile. Lloyd, D and Pevsner, N., The Buildings of England: Isle of Wight (2006), 175-76. * It is a little altered 1840s Neo-Romanesque style stone church by the distinguished architect James William Wild and has a landmark tower with stone spire. * The interior is complete except for the pews and has unusual c.1844-50 stained glass in the apse and an 1897 west window by C E Kempe.